Stare deep into the red abyss that is the new 2018 Ferrari SF71H Formula One car. Fall deep into every shiny red curve of its shape. Lose your mind in the madness that is its incredibly rosso corsa wings. 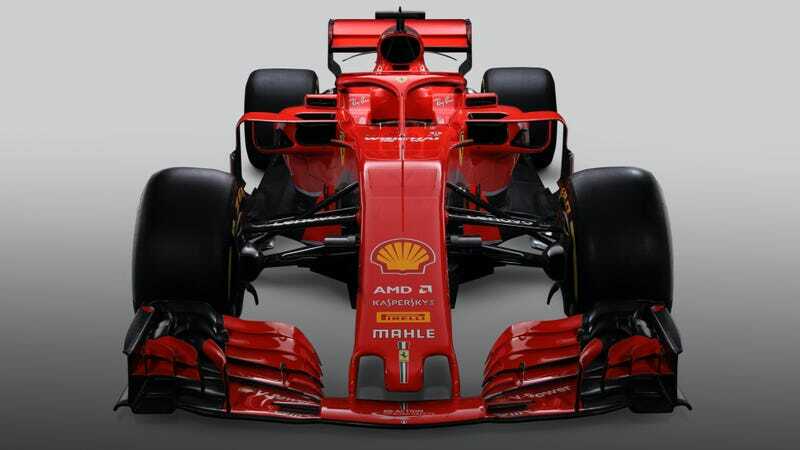 Ferrari’s new car is extremely red, as if they’re out for blood after a 10-year championship-free streak in F1. Like the others, it features a smaller sharkfin and a halo for 2017. The halo weighs about 15.4 pounds, but the rules only compensated for its addition with an 11-pound increase in minimum weight (from 1605 pounds to 1616 pounds), per Ferrari. This means the other components on the 2018 F1 cars can be that much lighter, and Ferrari’s weighs in at exactly that minimum weight. Much of the improvements to this year’s car were in the sidepods, the cooling system, and a slight lengthening of the car’s wheelbase, Sky Sports notes. The wheelbase length is now closer to that of the Mercedes that ultimately beat Ferrari to the championship last year. Ferrari has an extremely useful guide to all the nitty-gritty technical changes for 2018 here as well. Like fellow F1 engine builder Mercedes, much of the changes are under the engine cover in order to make engines last longer. Teams are only allowed three power units instead of four for next year, so everything has to be just a little more stout to accommodate the 40 percent increase in mileage each engine has to last. Ferrari’s new single-turbo 90-degree V6 062 Evo engine is 1600cc of fury, revving to 15,000 RPM. It’s all connected to a 4 megajoule hybrid system, which is half the hybrid power that top-class hybrid Le Mans prototypes were using but seems to get the job done for F1. The SF71H features a longitudinal semi-automatic Ferrari transmission with eight speeds plus a reverse gear with ultra-fast paddle-shifted electronically controlled shifts. A hydraulically controlled limited-slip differential helps maximize traction. The chassis itself is made from an ultralight carbon fiber and honeycomb composite structure. Ventilated carbon-disc Brembo brakes controlled through a brake-by-wire system help it stop. It all rides on 13-inch Brembo wheels. Ferrari has more detailed specs for the new car and its power unit here, if you’re curious. However, I’m the most curious as to how next season will play out. Ferrari gave Mercedes hell last year until they seemed to fall apart after the mid-point of the season. Maybe it was losing their home race at Monza? Either way, four-time F1 world champion Sebastian Vettel and 2007 F1 world champion Kimi Räikkönen are returning as drivers next year. Ferrari is widely considered the most solid chance for a good four-way battle for the championship next year against the ultra-dominant Mercedes duo. That prancing horse is thirsty after a decade out of winning form, too.